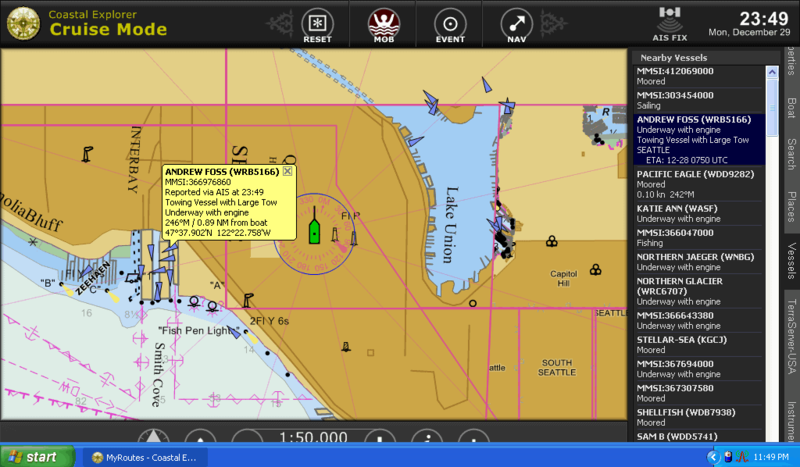 I was looking for PC based navigation software – there’s a lot of choices out there. Eventually after reviewing over 50 of them, I found one that had all of the options I wanted, was very well written, and had lots of good reviews online – Costal Explorer by Rose Point Systems. The program itself is moderately priced, and will run on most modern Windows operating systems. Being a Mac user myself, I also have it running in a virtual machine without any problems. The interface is well designed, which is one of my biggest complaints about all of the other options. Rose Point thought a lot about this area, and it really sets their product apart from others out there. Maps are available online for free from NOAA – links are provided within the software. If you want to review the features, head over to Rose Point Systems website and look through their documentation. They have a good screen shot gallery as well showing almost all of the features and screens. Key to me was easy navigation planning, which they have simplified compared to many of the other software out there. Easy click and drag, as well as quick feedback about your routes, obstructions, and estimation tools – all easily useable from the same screen. One of the concerning things about the product was lack of new upgrades since 2006, very slow responses on their support forums, and the fact that Maptech had a similar product – did they get bought? After a few emails to their tech support and sales departments, I had some nice exchanges with senior members of the company indicating that they had been focusing on some major new features that would be announced in 2008 at the Seattle Boat Show. Radar support, as well as some neat UI features were coming, as well as bugfixes and more. I ended up also purchasing the Maptech version called Chart Navigator Pro because I wanted the extra map data that comes with it. The products are identical, except that the Maptech version uses a different method of licensing. I primarily use the Rose Point version, and it also reads the Maptech data that is copied to my hard drive from the DVD install set. I’ve just begun to use the application, so as I see more things, I’ll post them here. Happy so far!